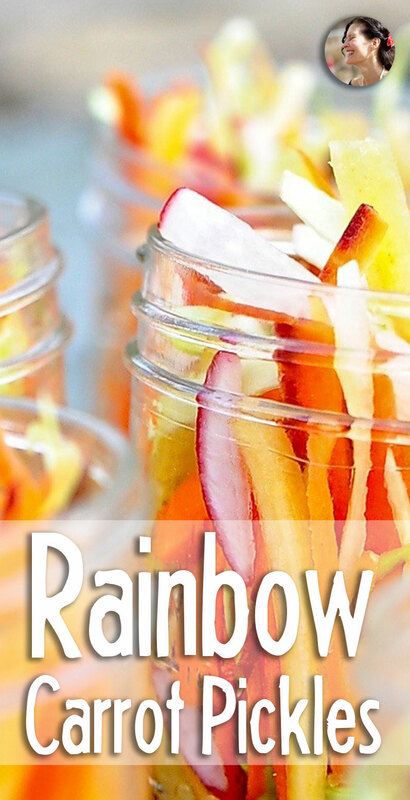 Make these Quick and easy Rainbow Pickles and brighten up your lunches for the week with a handful of these crunchy gems. So much healthier, more delicious and prettier then potato chips. These crunchy brined gems will wake up a hummus wrap, and add acidity and crunch to a simple brown rice buddha bowl. Layer them in a baguette with bbq-ed tofu and a smear of basil mayonnaise and you have the perfect lunch. Or eat them straight out of the jar if you’re sad. Pickles can cure a broken heart. True story. A tear soaked phone call. A midnight train. A dark and winding dirt road. And there stood my Aunt in front of her house, in the forest, on the fjord. I fell into her waiting arms with a dramatic snotty sob. She led me into her glowing dining room and handed me a jar of pickled squash and a box of chocolate. I snuffled eating my pickles right out of the jar with a fork while I related my story of the golden haired Danish boy who’d broken my heart. Ready for pity, I paused. Silence. A deep breath and I began again. My Uncle Torben and Aunt Helle, a natural born greek chorus, edited and molded my story, until it had gone from a 2nd rate tragedy of unrequited teenage love to a 1st rate adolescent farce. I retold the story with more flourishes that a coloratura soprano on opening night. A jar of pickled squash and box of brandied chocolates down (oh the iron clad stomach of youth) and my heartbreak had ebbed. I was ready to sleep and conquer a new day. 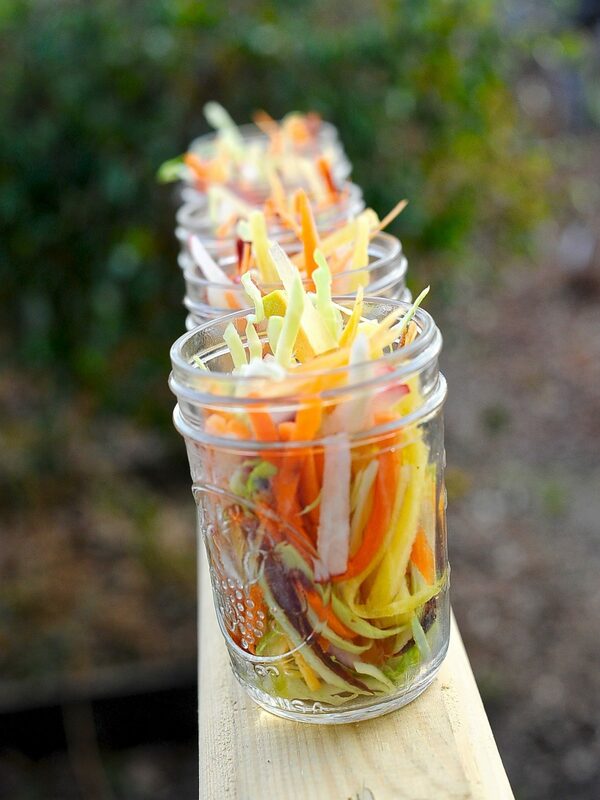 Last summer I made a huge batch of these Quick Rainbow Pickles with a friend. We ended up with a massive jar each. Two days later she called me and asked how my rainbow pickles were faring. So had had she, every crunchy, sweet, spicy, garlicy bite. A refreshing quick pickle that sparkles with bright flavor. Pull out a jar with every meal. 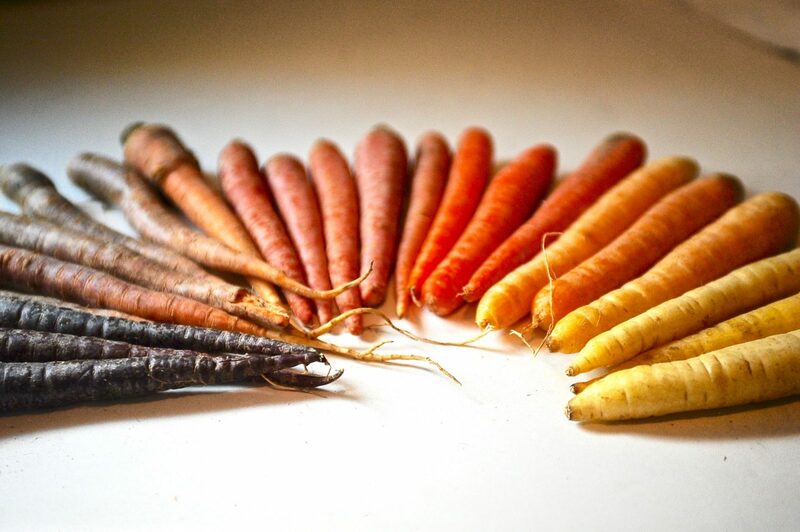 Make yourself a cup of coffee, pull out the cutting board and cut each carrot into short narrow sticks, make them as thin as you want, this is the time to show off your knife skills. Slice up your radishes into thin half moons. In a medium sauce pan combine vinegar, salt, sugar, ginger, jalapeño and garlic. Bring to a simmer stirring with a wooden spoon until the salt and sugar are dissolved. Simmer over heat five minutes. Remove from heat. 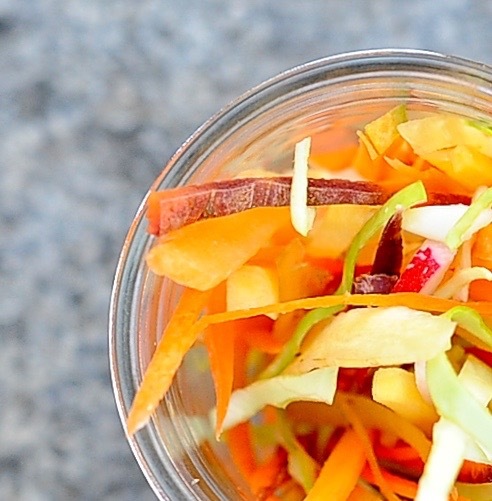 Place your carrots, radishes and cabbage in a large non-reactive bowl, and pour the hot pickling liquid over. Once cool enough to touch gently massage the veggies for about 2-3 minutes until the carrots lose a bit of their stiffness. Place the pickles into jars and pour in the extra pickling liquid to cover. Cap them and place in the fridge. Or alternately place all the veggies in a large bowl and cover with pickling liquid. Store in the refrigerator. These pickles will be good to eat in about two hours but are even more wonderful the next day. Just you wait, there may be a bowl of fava in you future with sharp red onion. I remember those Danish pickles – asier. When Aunt and Uncle said “asier” we heard “Asia” and in no time the new name for this delicacy in their household was “Asia Minors.” Aunt and Uncle loved playing with words, they loved a good story, and they had a deep appreciation for comfort food. 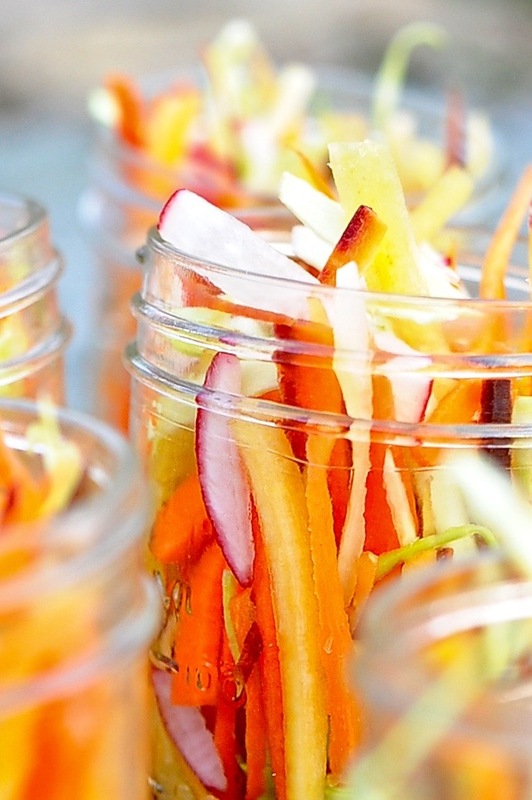 I want to make your rainbow pickled carrots tonight, to serve when friends come over for tacos and tortillas tomorrow. The fillings will include fried cubes of firm tofu in bbq sauce and hummus. All was word play in Aunt Helle’s domain. Yes the Asia Minors were so sweet and much softer than what americans think of as pickles. Those tacos sound delicious. Dinner? Tacos? I’m there. Let me just hop on a plane, I’ll be there by 7. Beautiful and delicious. What more could you want? A bigger mouth. smiley emoticon. Thank you. I’m searching for a rice wine vinegar in large bottle format source…..Restaurant Depot maybe? 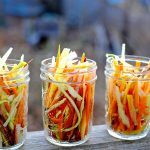 I’m going to make your carrots this Saturday, and try to make pickled squash too! Large format. Restaurant Depot sounds like the best bet. Too bad that huge Asian market around Reservoir closed. I made your rainbow carrot pickles yesterday and ate them today for lunch. My boys ate them later for dinner. Fabulous! Really delicious. Needed something tasty and colourful on this miserable, rainy winter day. Thanks Johanne. Can’t wait to make more of your wonderful recipes. Thank you! I’m glad you enjoyed them. A little tang, crunch and dark chocolate will see us through till spring. Aaron Sanchez and Alex Gaunachelli would approve. Have you ever noticed that pickling a basket ingredient is akin to using bacon: sure fire win. Food for thought. So right my love. I got a little distracted when you mentioned Aaron but now I’m back on track.